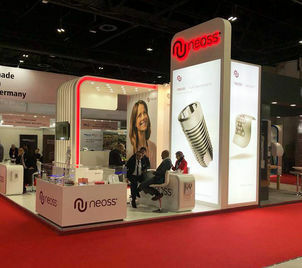 The Neoss Middle East & Africa team attended AEEDC Dubai 2018, the 22nd annual UAE International Dental Conference & Arab Dental Exhibition held at the Dubai International Convention & Exhibition Centre from 6th to 8th February. Since the inauguration of its Dubai branch in September 2015, the company has signed agreements with ten distributors in the region and has recruited additional staff to support local sales, training, and education programmes. AEEDC 2018 was an opportunity for the Neoss Middle East & Africa team, led by Area Sales Manager Ahmed Ghandour, to build new relationships and showcase an innovative range of dental implant solutions. See more upcoming events that Neoss will be attending.